Born: December 11, 1836 in Yarmouth Ma. Died: January 4, 1926 in Bourne Ma. at 89 yrs, 24 d.
1. Mary Loring Swift Lincoln; (June 28, 1855 – 1938); Married Charles L. Lincoln, Jr. (1854 – 1938) (Charles L. Lincoln & Mary Jane Brown) in New Bedford Ma. on September 5, 1878; Mary & Charles are buried with their daughter , Elsie A. Lincoln, in Cataumet Cemetery. 2. Edward Herman Swift; (September 16, 1857 – September 10, 1938); Edward was a carpenter; He died at 80 yrs, 11 mos, & 25 d., unmarried & is buried in Cataumet Cemetery. 3. Albert N. Swift; (December 25, 1859 – September 1, 1887); Albert died at 27 yrs. & is buried in Cataumet Cemetery. 4. Clara Bell Swift Clement; (December 9, 1862 – August 15, 1944); Married William Henry Clement, Capt. (1844 – 1924) (Isaac Clement & Achsah/Excy Hall) in Sandwich Ma. on February 8, 1884; William married (1) Josephine M. Gibbs (1850 – 1878) (Phineas Gibbs & Ann Maria Cushman) in Sandwich Ma. on January 25, 1863; Josephine & her son, Rodolph Clement, are buried in Pocasset Cemetery; Clara & William are in Cataumet Cemetery. 5. Andrew D. Swift; (August 23, 1865 – February 24, 1889); Married Emily B. Marsh (1867 – ?) (Charles Wesley Marsh & Julia A. Webber) in Bourne Ma. on December 15, 1885; Andrew is buried in Cataumet Cemetery. 6. Eva Johnson Swift Bugbee; (December 24, 1867 – November 20, 1958); Married Edgar Franklin Bugbee (1851 – 1911) (William P. Bugbee & Abby Burt) in Taunton Ma. 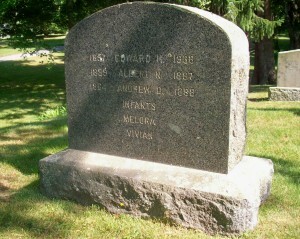 on October 31, 1889; Eva & Edgar are buried in Mayflower Hill Cemetery in Taunton Ma..
7. Melora A. 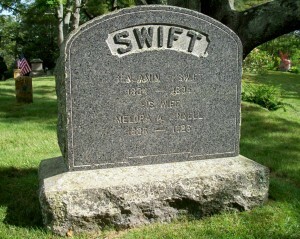 Swift; (July 6, 1870 – September 13, 1870); Melora is buried in Cataumet Cemetery. 8. Benjamin Franklin Swift; (September 18, 1871 – ? ); Married Margaret H. Deveraux (1868 – ?) in Bourne Ma. on April 12, 1892; They had 4 children. 9. Willis Clifton Swift; (December 3, 1873 – May 4, 1959); Married Esther Frances Perry (1872 – 1965) (Edwin Perry & Caroline Augusta Rosella Ellis) in Bourne Ma. on November 25, 1902; Willis was a carpenter, They lived at County Rd. in Cataumet Ma. & had no children. 10. Vivian M. Swift; (November 19, 1876 – April 6, 1876); (confusing dates in Sandwich Vital Records); Vivian died at 4 mos, 18 d. & is buried in Cataumet Cemetery. 11. John Swift; (November 19, 1876 – ? ); Swift Genealogy, page 138.